Softubs are a joy to use at any time, in any weather, but there’s just something about soaking in the dark that takes the experience to another level. The cool, crisp air. The stars above. The quiet. It all helps you to sink deeper into the moment. Focused, your senses come alive. Your stress and your aches melt away. Your body and mind thank you for this respite from the hustle and bustle. The experience is wonderful alone, or with company. If you Softub solo, you can work on meditation, simply reflect on your day, or visualize the next day. You can really soak up the silence and the solitude. If you have company, you can take turns calling out the constellations in the cosmos, enjoy your favorite playlists, and circulate some cocktails. It’s not always about the quiet. There’s still something about the twilight hours that add that extra bit of excitement into social gatherings too. Is it stormy out? Move things indoors. You can do that with a Softub! Set it up, plug it in, and light some candles. Heck, maybe even position a t.v. nearby. Movies are best enjoyed in the dark! Treating yourself to a calm, quiet, undistracted Softub soak at night can also serve to help you get a better, deeper sleep! 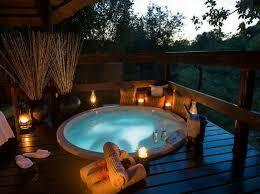 That said, we recommend you Softub every evening! Why sit on your couch channel surfing until you’re tired enough to turn in (screens are detrimental to quality sleep anyhow) when you can recreate the scenarios mentioned above. Night after night. And with that, we’re off for our nightly Softub soak. Good night!